Tacos are one of the most beloved foods around. I have yet to meet a child (or adult!) who doesn’t love tacos. They are a staple in many families – ours included! Taco kits and fast food restaurants, however, have eroded the quality of the beloved taco. They have become rich with the kinds of things we don’t want to be feeding our kids – salt, preservatives, MSG, and a hefty dose of saturated fat. The good news is that you can make amazing, nutritious tacos with this simple technique. 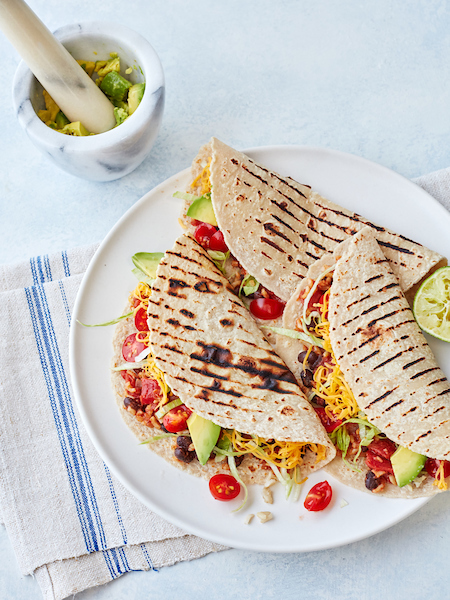 You can easily make a meal that is loaded with veggies and flavor and that all-around taco deliciousness that we all love! Your family will love them – I promise! Please experiment and find the spice balance you love. Make it your own! *riced cauliflower can be purchased in many supermarkets in the produce aisle. You can also easily make your own by grating cauliflower on the large setting of a box grater. Heat tortillas or taco shells according to package drections. Prep all of your toppings and put into individual bowls. Sautee the diced onion in a bit of olive oil until translucent, about 5 minutes. Add minced garlic and sauté a minute more. Add the chili powder and smoked paprika and stir until your kitchen smells amazing. Add the riced cauliflower and ½ cup of water. Cook, stirring occasionally, until the water evaporates and cauliflower softens, about 5 minutes. Add beans and tomatoes. Stir to incorporate all the delicious spices with the beans and cauliflower. Use enough of the juice from the tomato can so that the mixture is moist but not soupy. When heated through, serve in warm soft or hard taco shells with whatever toppings please you. Sit back and await the rave reviews!